Oregon growers produce more deciduous shade trees than any other state in the country, according to the 2012 USDA Census of Horticulture. In that extensive category of trees, Japanese maples are Oregon’s top selling type of tree. In fact, the Oregon crop of Acer palmatum was valued at $26.2 million, which represented 54 percent of the national market. In addition, other Acer species with similar characteristics and landscape uses, all considered to be Japanese maples in a broader sense, pushed the numbers even higher. What accounts for the popularity of these trees and for Oregon’s unique ability to grow them so well? The answers are at once simple and complex. For starters, Oregon provides the ideal climate for experienced growers to produce bigger trees faster. Oregon’s climate advantage is so great that even with costs for shipping, Oregon growers can produce higher quality trees at a lower cost. But it is the extraordinary and diverse beauty of Japanese maples that drives demand. These trees, which include several species of maples native to Japan, China and Korea, offer an unparalleled range of graceful, elegant forms and habits, textures and colors. The size, shape and growth rate can be fairly small, rounded and slow, or they can be fairly large, upright, broad and fast, developing into single or multi-stemmed trees as well as weeping and even columnar forms. Hundreds of available cultivars offer diverse leaf shapes and arrangements that lend a variety of textures and striking spring, summer and fall colors to virtually every landscape design. “Whatever size or color you want, there’s an option,” said designer Brent Markus, owner of Rare Tree Nursery and Conifer Kingdom in Silverton, Oregon. On Conifer Kingdom’s website (www.coniferkingdom.com), users can look for trees by color (red, purple and burgundy, green, multi-colored and yellow), by growth rate (dwarf: less than 6 inches/year; intermediate: less than 12 inches/year; and large: up to 18 inches/year), by leaf type (strap-leaf, laceleaf and broad leaf) and by type/species. The option of colorful twigs adds more potential for splash in the landscape, too. Side-by-side pictures on the website provide a useful comparison of leaf size and shape, displaying leaves from 44 Acer palmatum cultivars, 10 A. japonicum cultivars and 13 A. shirasawanum selections. In addition to those, other Acer species that qualify as Japanese maples include pseudosieboldianum, sieboldianum and pseudoplatanus. Although Japanese maples don’t work well in areas of extreme cold or heat, they are widely used in large swaths of the country, in climates as diverse as Dallas and Chicago. Although the bulk of the Japanese maple market in the U.S. consists of the laceleaf types, four cultivars claim the lion’s share, according to Markus. The listings in the OAN Nursery Guide reflect that: ‘Crimson Queen’ lists 52 growers, ‘Inabe shidare’ 27 growers, ‘Tamukeyama’ 46 growers, and the slightly more dwarf, slower-growing ‘Red Dragon’ 46 growers. Red uprights enjoy a large market share, too, especially ‘Bloodgood’ and Emperor I®. Best-known of the red upright Japanese maples and widely spec’d, ‘Bloodgood’ stands out as the household variety for its good hardiness, reliability and long-lasting color. Emperor I (aka “Red Emperor” or A. p. ‘Wolff’) is similar to ‘Bloodgood’ but leafs out a couple weeks later, which makes it less prone to late spring freezes. As a result, Markus sees an opportunity for small and medium-size nurseries to increase their level of production, especially with newer varieties. However, the popularity and ease of producing Japanese maples contributes to their overproduction. Following the economic crash in 2008, many growers in the industry were forced to destroy hundreds of thousands of Japanese maples. Nurseries that fared better following the crash benefitted from offering more unusual selections, sizes and cultural techniques, Schmidt said. Don Schmidt Nursery, for instance, has about 350 cultivars of Japanese maple in major production. “The unique cultivars helped sell the more common ones during the downturn,” Schmidt said. Like many nurseries, though, Schmidt sells more ‘Bloodgood’ and Emperor I than any other Japanese maple. Still, to guarantee a niche in the market, growers look for ways to distinguish themselves among the competition. For Don Schmidt Nursery, that means selling bigger sizes of field-grown trees, from 1-inch caliper to much bigger, mature specimen trees, all sold B&B. Trees are hand-weeded and hand-trimmed to produce shorter, stockier shapes and sturdy root systems on a 6–10-year growth cycle. They are also hand-dug to accurately match rootball to individual tree. The nursery also utilizes dryland farming methods to grow trees naturally without supplemental watering. Doing so produces tough trees with well-developed roots that are able to withstand higher levels of environmental stress and drought, Schmidt said. Dryland farming techniques are not new. The nursery has been growing that way since its founding in 1939, before widespread irrigation. But, the methods are newly relevant, as water has become a more costly and scarce commodity. The nursery plants about 20,000 new liners each year in the fall, when rains reliably provide the necessary water. During the growing season, fields are cultivated by disc about every eight to 10 days, to pull up moisture from lower levels so roots can access it. Over the generations, the only thing that has changed in the method is the power source, Schmidt said, from horses to tractors. 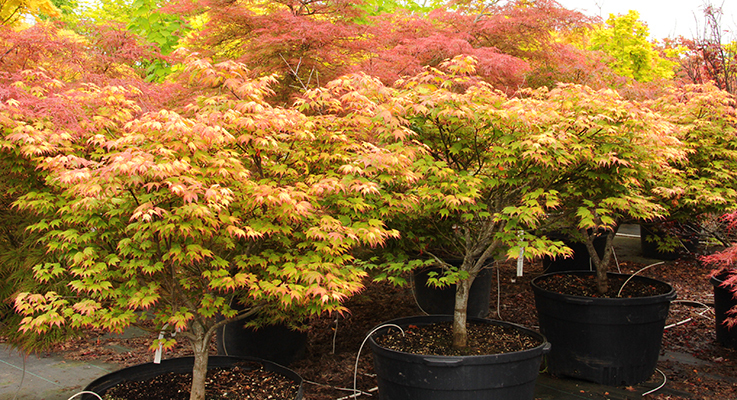 Bizon Nursery, a wholesale grower in Hubbard, Oregon, that supplies retail-ready and B&B Japanese maples to garden centers and re-wholesalers throughout the U.S. and Canada, bases about 85 percent of its production upfront on demand from customers, said B&B Manager Eric Bizon. That means they grow a lot of ‘Bloodgood’ and sell thousands in sizes from 3-gallon to 10-foot B&B. “People like red uprights, and ‘Bloodgood’ is well known and frequently spec’d on jobs,” Bizon said. One challenge associated with some great Japanese maples is the difficulty of the cultivar names, Bizon pointed out. For instance, one of his favorite trees for production, which grows well and holds its summer color better than other laceleafs, has a “horrible name,” he said. Grown by plenty of nurseries, ‘Tamukeyama’ may be a great tree, but for the average end consumer, its name is a stumbling block. A new laceleaf from The Netherlands called ‘Firecracker’ also grows vigorously and holds its color well, and Bizon predicts it will become a standard production plant with a much more accessible name. Bizon gives garden centers an easy, convenient way to easily bring a more diverse assortment of trees to their customers. “Accent Packages” combine assortments of less-familiar varieties of Japanese maple in 3-gallon containers in a range of colors, forms and growth habits. Kinen’s Big & Phat Special Plants, a specialty grower in Boring, Oregon, has defined its niche in the market using vigorous annual pruning to sculpt finished smaller Japanese maples over at least 10 years. The all-B&B operation offers both multi-stem and tree-form maples. He also likes a green upright called ‘Villa Taranto’, which he said produces “insane fall color, a kaleidoscope of red, yellow and orange.” A daintier, linear leaf, “like a hand with thin fingers” and compact size — no more than 10 feet — add to this tree’s desirability. One Japanese maple, a green, upright dwarf, was lauded by every grower: ‘Mikawa yatsubusa’. “It stays tight and neat with dainty leaves and attractive warty bark, and it develops a big trunk,” Kinen said. “Leaves grow closely together the entire length of each branch.” A 20-year-old specimen Kinen has is only 5 feet tall, a growth rate that also makes it popular for bonsai culture. “The layered leaves look like shingles,” Dittmar said, and if staked, it can gain height. “‘Mikawa yatsubusa’ should be in every yard,” Schmidt said. The extremely popular tree is the rare instance of a green Japanese maple outselling the red. Another up-and-comer that has the attention of the industry is ‘Twombly’s Red Sentinel’. Its unique columnar form — alone among full-size red A. palmatum cultivars — and smaller leaves account for its increasing popularity. “It has fantastic color retention,” Markus noted, and it has proven to be extremely hardy in Chicago. In the harsh winter of 2013–14 there, not a single branch died back. Schmidt also suggested ‘Pixie’ and ‘Skeeter’s Broom’ as smaller, red columnar options, and ‘Tsukasa Silhouette’ for a green columnar tree that produces great red fall color. As an alternative to ‘Bloodgood’, Iseli offers ‘Sherwood Flame’, an A. palmatum seedling selected from ‘Burgundy Lace’ and developed by Will Curtis of Sherwood, Oregon. Dittmar described it as having “great form and good color that is easy to culture.” It also offers good heat tolerance and a distinctive winter look from attractive branching and bark with silver striations. A unique option, the only upright maple with dissected laceleaf foliage, green ‘Seiryu’ was recommended by both Iseli and Schmidt. The popular tree combines good form and size with nice red color in the fall, and it has proven to be hardier in Michigan, Schmidt said. Schmidt said that ‘Hime shojo’ shows potential as an up-and-coming red dwarf that stays brighter during summer. ‘Koto no ito’ is a semi-dwarf with a bamboo-type leaf that consistently sells well for Schmidt. Its delicate foliage produces an airy feel that provides privacy without blocking the view, he said. And it can tolerate 80 percent shade. For interesting coloring, Schmidt recommends ‘Ever Autumn’ for its bright orange spring growth, orange highlights on green summer leaves and orange-red fall color. Markus selected ‘Tsuma gaki’ and ‘Tsuma beni’ for interesting color effects. Both look like they have painted fingernails. ‘Tsuma gaki’ has yellow-green leaves that emerge cupped with burgundy-orange tips, while ‘Tsuma beni’ has pale green leaves with red tips. Bizon recommended the hardier A. shirasawanum ‘Moonrise’ (Zone 5), a popular, multi-branch upright bush that has brilliant orange-pink spring growth and peach-yellow leaves all summer. It does well in the South, too.